Developer: Nd Cube Co., Ltd.
All galactic speed limits are about to be broken! 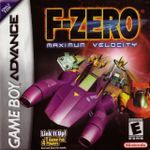 F-Zero Maximum Velocity has arrived, and the future of racing has never looked so sweet. Brand-new vehicles and Game Boy Advance original tracks await, so whether you're a Super NES veteran or a race rookie, you'll need some practice laps. And even if you do master the Grand Prix circuit, you'll still have to beat your friends to the finish line. That's right, race fans—with the Game Boy Advance Game Link cable you can take on up to three rival racers, so put the pedal to the metal and get busy boosting, bumping and jumping your way to intergalactic glory! Two blistering multiplayer modes! In Single-Pak play, link 2, 3, or 4 Game Boy Advance systems using a single Game Pak; in Multi-Pak, link 2 to 4 systems using on Game Pak per person. Unlock hidden vehicles and tracks as you master 20 different courses at four difficulty levels! Use multiple Game Paks and link up to exchange course records with your friends!